This 33x39mm. 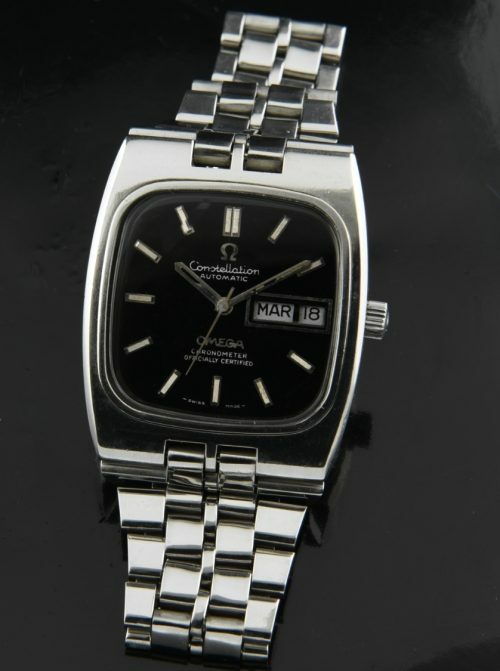 stainless steel OMEGA CONSTELLATION dates to the 1970’s. These watches look large on the wrist due to their shape. The black dial was restored at some time in the past and really pops with the silver gilt print. The crystal is OMEGA signed, as is the winding crown. The automatic winding OMEGA movement was just meticulously cleaned and is accurate. The integrated steel OMEGA bracelet will fit up to a 7.5 inch wrist. The day/date feature makes this a very practical watch. This can be your daily wearer-just $1150.